It has been a while since I have performed a solo set. I will be presenting a new work for tapes and walkie-talkies. I am excited about the lineup. I hope to see everyone there! 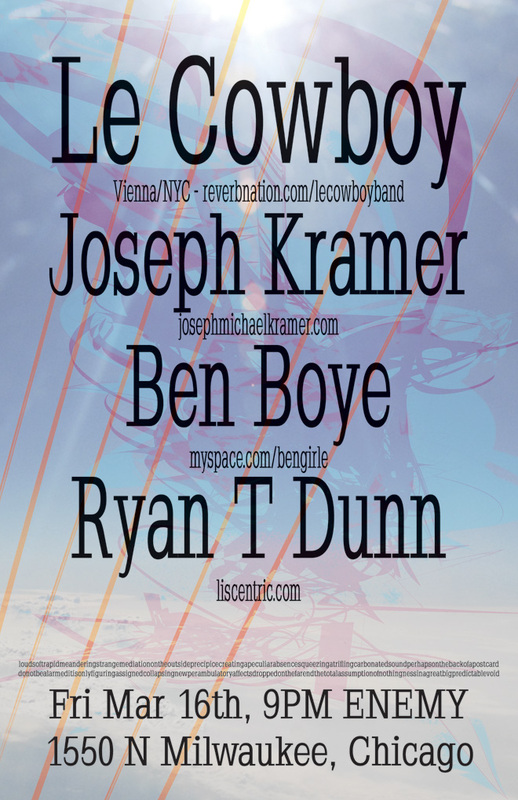 Le Cowboy is on tour from NYC, with members from Vienna. They’ve been un-preserving fresh jams for your listening pleasure. Joseph Kramer handles tape more deftly than Deputy Andy and tape players more smoothly than Lloyd Dobler. Ben Boye prepares to autoharp on you and not soundboard in your piano. Ryan T Dunn wiggles his tongue, babbles, and sounds like babies hung from tongs.